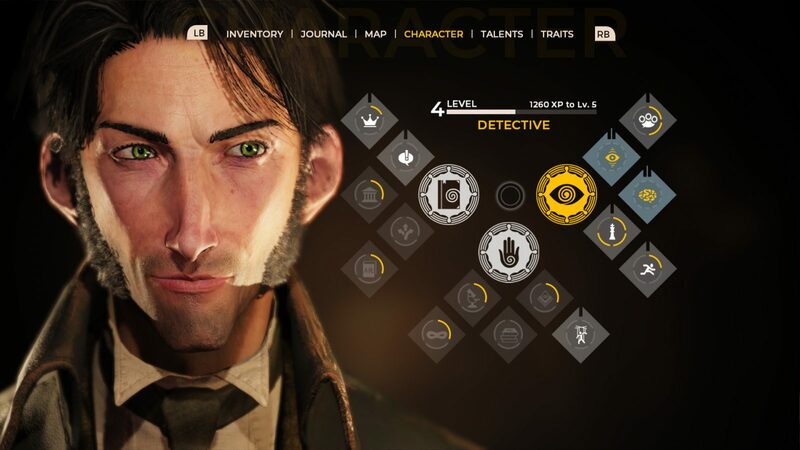 The Council gets off to an excellent start thanks to its brilliant characters, clever gameplay, unique RPG elements and the threat of long-lasting consequences, which ensured that I was captivated from start to finish. Twice. As Leonardo da Vinci once wrote, ‘every action needs to be prompted by a motive’, it is this mantra that perhaps best defines The Council’s intricate narrative-driven gameplay. How will you garner the information you require to solve the mystery of your missing mother? Will you coerce your colleagues into giving up the information you seek? Or will you help others in the hope that they’ll return the favour later down the track? Perhaps just as apt is Issac Newton’s famous quote, that ‘to every action there is always opposed an equal reaction’, and just like in real life, your motives and choices can make or break friendships, which in The Council are paramount to you succeeding in your achieving your goal – finding your mother. 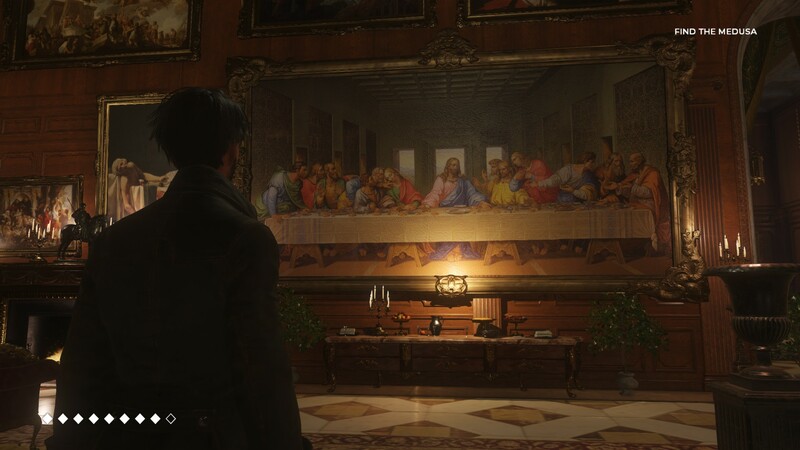 Surprisingly, the first episode of The Council crafts a narrative and universe that is easy to get immersed in, and the due to the game’s episodic nature my dual playthroughs finished on separate cliffhangers that left me eager to return to Lord Mortimer’s manor to continue my investigation. Surely a man of God can be trusted? 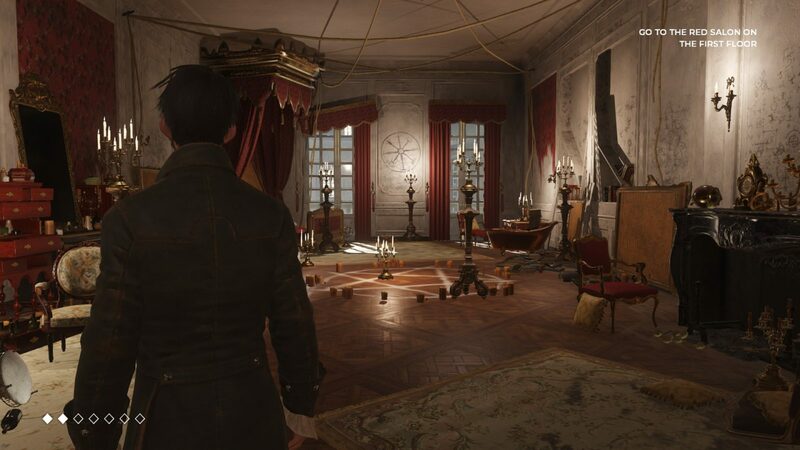 Set in 1793, The Council is a narrative-driven adventure game that puts you in the chaussures (French for shoes) of Monsieur Louis de Richet, a Frenchman and son to Sarah de Richet, a high-ranking member of The Golden Order, a secret society featuring some of history’s most influential individuals, such as Napoleon Bonaparte. Louis, also a member of The Golden Order, is invited to the private island of enigmatic aristocrat Lord Mortimer due to his mother’s disappearance. Using a myriad of skills, Louis must unravel the mystery surrounding his mother’s vanishing as well as finding out who within The Golden Order can be trusted. The gameplay in The Council is relatively straightforward, with players given different dialogue choices to make in order to progress. Your dialogue choices supposedly have long-lasting consequences, which are set to carry across the game’s five episodes. Think Choose Your Own Adventure books but without the ability to go back and make amends should you make the wrong choice. 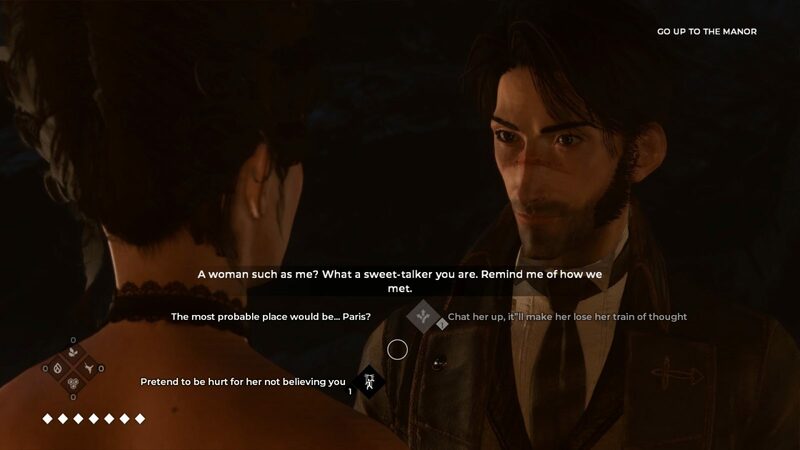 While it sounds black and white in nature, developers Big Bad Wolf have managed to spice it up by including a Social Influence System, which allows Louis to learn his companion’s traits (such as their vulnerabilities and immunities) which he can later exploit by using acquired skills. Upon your arrival on Lord Mortimer’s private island you are given the option to pick one of three classes to become your primary, Diplomat, Occultist or Detective, each with their own skill tree. The Diplomat tree focuses on a player’s political skills, the Occultist tree focuses on deception and the Detective tree is all about having a keen eye for detail. You can upgrade all three of these trees as you wish, however different dialogue choices will be available depending on what skills you have learnt. For example, early on in your investigation you can convince an Order member that you’ve met before by making them feel bad by using your powers of manipulation, or you can wing it and have a stab in the dark (a far less convincing answer) if your powers of rhetoric aren’t quite up to snuff yet. Not all skills are exclusive to conversation either, with some, such as the subterfuge skill in the Occultist tree allowing you to unlock chests without having the key handy. No key or no subterfuge skill? No unlocking the chest. 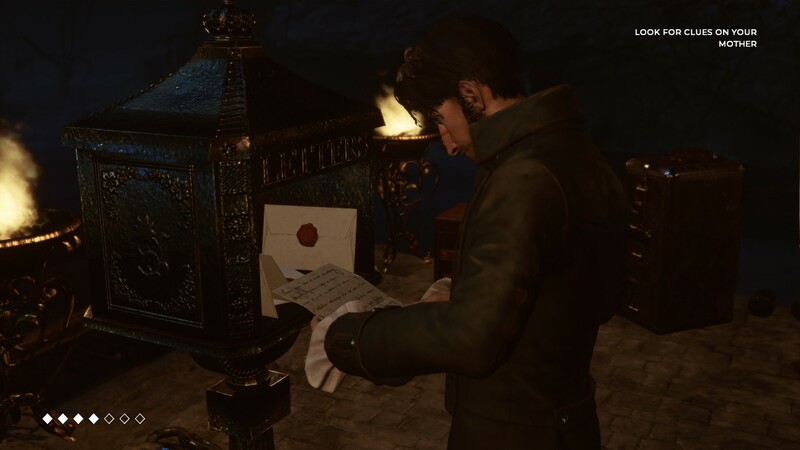 Players can also learn skills by reading different manuscripts acquired throughout your investigation, which are equipped at the beginning of each quest. Furthermore, skills can be acquired through actions, such as intervening in an altercation before somebody gets hurt. Skills don’t come free though. Every time you use a skill it uses effort, with some skills requiring more effort than others depending on your skill level. You start off with eight effort points and you can increase the number of effort points by collecting amber. If you don’t have the required effort points to use a skill you can top up your effort points by two points by consuming Royal Jelly, or you can consume Carmelite Water, which allows you to use your next skill at no cost, or you can choose non-skill-based dialogue choices. Other consumables are Devil’s Thorn, which grants you the ability to see a character’s vulnerabilities and immunities for a brief period of time, and Golden Elixir, which cures your negative alterations such as being intoxicated from too many consumables. Occasionally players will have Opportunities presented to them if they have the required skill that is. These are usually time-based sequences that allow you to notice something quickly about someone or something. Missing these moments can lead to missing out on important information about a character’s personality. You’ll also have hard-hitting decisions to make. Do you help George Washington search another person’s room, or do you focus on your own investigation at the cost that Washington may not be inclined to help you out later in the piece? All of these decisions affect the game’s story, which is emphasised by my two playthrough’s vastly different endings. In some choice-driven games it’s impossible to fail simply because the game won’t let you. Thankfully in The Council you can fail, and if you do fail you can’t rewind time and try again. The most important narrative moments are called Confrontations. These are sequences that usually require you to earn someone’s trust or to convince someone to do something. It is here where your skills matter most, as you only have a certain number of blunders available before you fail. One of the confrontations sees you having to convince Napoleon Bonaparte that you’re the right man for the job. 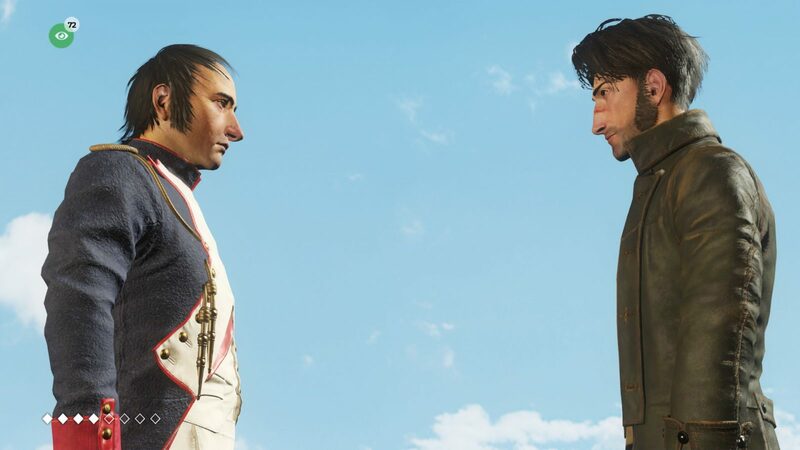 In my first playthrough I failed to convince Monsieur Bonaparte that he could count on me, but in my second playthrough where I made opposing choices to my first I had the French army lieutenant eating out of the palm of my hand. The majority of the 3-4 hour episode (and I am assuming the forthcoming episodes) is spent for conversing with other members of The Order, so if you’re not a fan of perorating then The Council may not be for you. However, I do appreciate a quality narrative-driven game with lots of exposition, and thankfully the voice-acting is, for the most part, good quality. There is the occasional line that comes across a little flat and the lip-syncing is almost non-existent, but nothing that really ever breaks the intrigue of the premise or the characters. 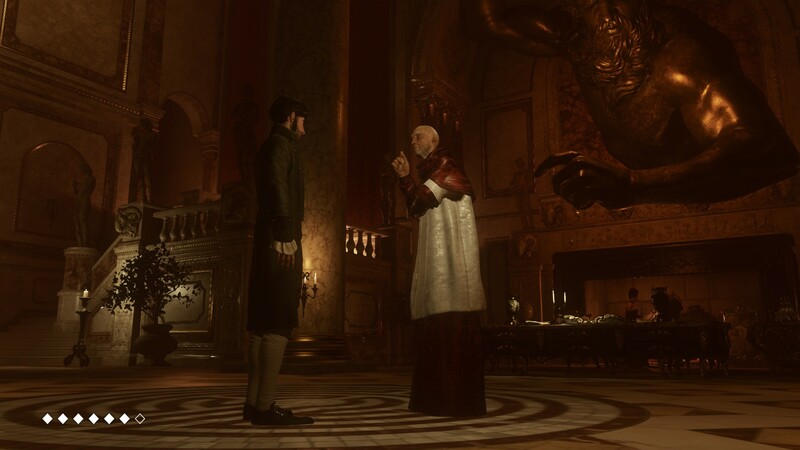 The gameplay isn’t confined to conversation, with Louis able to explore the halls and rooms of Lord Mortimer’s estate in search of clues and consumables. Visually the game has nailed the atmosphere, and it’s no slouch in the graphic department. The majestic grandeur of Lord Mortimer’s manor is spectacular, so much so that I wish the devs had included a photo mode. Lord Mortimer spares no expense, with his opulence extending to every room of the manor thanks to an impressive collection of lavish renaissance paintings, giant statues and historical artefacts. The character models are also fairly well done, although sometimes they can look rather lifeless. The Council’s first episode sets the scene for a captivating narrative and has all the ingredients to be one of the best story-driven games of the year. Big Bad Wolf have managed to craft a world full of splendour, intrigue and deception thanks to a fascinating narrative filled with beguiling characters, choice-based gameplay and meaningful RPG mechanics. After one episode of The Council I am hooked. I cannot wait to see how the mystery unfolds and what long-lasting consequences my choices will have. I just hope we don’t have to wait too long before we head back to Lord Mortimer’s island.